A potential hazard has been identified in that the wooden crib slats can break, creating a gap, which can pose an entrapment and strangulation hazard to infants and toddlers. No incidents or injuries have been reported. 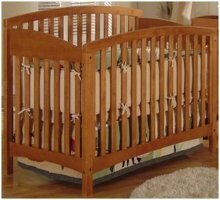 Consumers should immediately stop using the recalled cribs and contact Dorel Distribution Canada at 1-800-295-1980 between 8:00 AM and 5:00 PM ET Monday through Friday to receive an alternate, replacement crib.